The Well of Zam zam is a well located within the Masjid al Haram in Mecca, Saudi Arabia, 20 meters east of the Kaaba (see Kaaba Old Photos of 1880 & 1953), the holiest place in Islam. According to Islamic tradition it was a miraculously- generated source of water, which began thousands of years ago when Ibraham’s infant son was thirsty and kept crying for water and was kicking at the ground when water gushed out. Millions of pilgrims visit the well each year while performing the Hajj or Umrah pilgrimages, in order to drink its water. By Saudi law, the water cannot be sold outside of the kingdom, but because of strong demand there is a thriving market in fake Zamzam water in other countries. 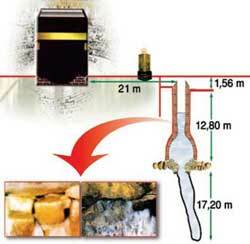 The Zamzam well was excavated by hand, and is about 30 metres deep and 1.08 to 2.66 metres in diameter. It started 4000 yrs ago. Zamzam water has no colour or smell, but it has a distinct taste, and its pH is 7.9-8.0, indicating that it is alkaline to some extent. Never changed the taste, no Algea or plant growth in the pond, thus no disease caused. Its potability has always been universally recognised as pilgrims from all over the world visit Khaan-i-Ka’aba every year for hajj and umrah, but have never complained about it. Instead, they have always enjoyed the water that refreshes them. Water tastes different at different places. Aab-i-Zumzum’ s appeal has always been universal. Biological growth and vegetation usually takes place in most wells. This makes the water unpalatable owing to the growth of algae causing taste and odour problems. But in the case of the aab-i- Zumzum well there wasn’t any sign of biological growth. 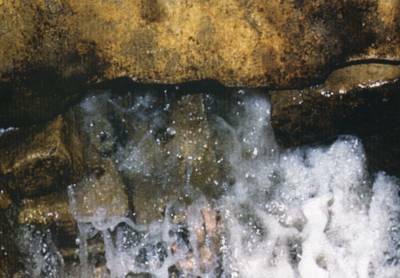 It taps groundwater from the wadi alluvium and some from the bedrock. Originally water from the well was drawn via ropes and buckets, but today the well itself is in a basement room where it can be seen behind glass panels (visitors are not allowed to enter). Electric pumps draw the water, which is available throughout the Masjid via water fountains and dispensing containers near the Tawaf area. The water level is 3.23 metres (about 10.59 ft) below the surface. This small pond provides water to millions of people through heavy motors pulling 8000 litres/second for more than a 24 hour period showed a drop in water level from 3.23 metres below surface to 12.72 metres and then to 13.39 metres, after which the water level stopped receding. When pumping stopped, the water level recovered to 3.9 metres below surface only 11 minutes later. This data shows that the aquifer feeding the well seems to recharge from rock fractures in neighbouring mountains around Mecca. In 1971, an Egyptian doctor wrote to the European Press, a letter saying that aab-i-Zumzum was not fit for drinking purposes. I immediately thought that this was just a form of prejudice against the Muslims and that since his statement was based on the assumption, that since the Khaan-i-Ka’aba was a shallow place (below sea level) and located in the centre of the city of Makkah, all the waste water of the city collecting through the drains fell into well holding the water. Fortunately, the news came to Shah Faisal’s ears who got extremely angry and decided to disprove the Egyptian doctor’s provocative statement. He immediately ordered the Ministry of Agriculture and Water Resources to investigate and send samples of aab-i-Zumzum to European laboratories for testing the pot-ability of the water. The ministry then instructed the Jeddah Power and Desalination Plants to carry out this task. It was here that I was employed as a de-salting engineer (chemical engineer to produce drinking water from sea water). I was chosen to carry out this assignment. At this stage, I remember that I had no idea what the well holding the water looked like. I went to Makkah and reported to the authorities at the Khaan-i- Ka’aba explaining my purpose of visit. They deputed a man to give me whatever help was required. When we reached the well, it was hard for me to believe that a pool of water, more like a small pond, about 18 by 14 feet, was the well that supplied millions of gallons of water every year to hajjis ever since it came into existence at the time of Hazrat Ibrahim, many, many centuries ago. I started my investigations and took the dimensions of the well. I asked the man to show me the depth of the well. First he took a shower and descended into the water. Then he straightened his body. I saw that the water level came up to just above his shoulders. His height was around five feet, eight inches.He then started moving from one corner to the other in the well (standing all the while since he was not allowed to dip his head into the water) in search of any inlet or pipeline inside the well to see from where the water came in. However, the man reported that he could not find any inlet or pipeline inside the well. I thought of another idea. The water could be withdrawn rapidly with the help of a big transfer pump which was installed at the well for the aab-i-Zumzum storage tanks. In this way, the water level would drop enabling us to locate the point of entry of the water. Surprisingly, nothing was observed during the pumping period, but I knew that this was the only method by which you could find the entrance of the water to the well. So I decided to repeat the process. But this time I instructed the man to stand still at one place and carefully observe any unusual thing happening inside the well. After a while, he suddenly raised his hands and shouted,”Alhamdolli llah! I have found it. The sand is dancing beneath my feet as the water oozes out of the bed of the well.” Then he moved around the well during the pumping period and noticed the same phenomenon everywhere in the well. Actually the flow of water into the well through the bed was equal at every point, thus keeping the level of the water steady. After I finished my observations I took the samples of the water for European laboratories to test. Before I left the Khaan-i-Ka’aba, I asked the authorities about the other wells around Makkah. I was told that these wells were mostly dry. When I reached my office in Jeddah I reported my findings to my boss who listened with great interest but made a very irrational comment that the Zumzum well could be internally connected to the Red Sea.How was it possible when Makkah is about 75 kilometres away from the sea and the wells located before the city usually remain dry? The results of the water samples tested by the European laboratories and the one we analysed in our own laboratory were found to be almost identical. The difference between aab-i-Zumzum and other water (city water) was in the quantity of calcium and magnesium salts. The content of these was slightly higher in aab-i-Zumzum. This may be why this water refreshes tired hajjis, but more significantly, the water contains fluorides that have an effective germicidal action. Moreover, the remarks of the European laboratories showed that the water was fit for drinking. Hence the statement made by the Egyptian doctor was proved false. When this was reported to Shah Faisal he was extremely pleased and ordered the contradiction of the report in the European Press. In a way, it was a blessing that this study was undertaken to show the chemical composition of the water. In fact, the more you explore, the more wonders surface and you find yourself believing implicitly in the miracles of this water that God bestowed as a gift on the faithfuls coming from far and wide to the desert land for pilgrimage.